In 2015, filmmaker and historian Jane Anderson sent quilt restorer Ann Wasserman a quilt for stabilization and repair. The quilt is inscribed with many names. The names are all written by the same hand, which indicates that it was a fundraising project rather than a friendship or signature quilt. To raise money, people would pay to have their names written on the quilt, and then later on, the quilt would be raffled. Unlike many such quilts, this one has no indication of either the date, location, or beneficiary of its making. Ann was curious and checked into a couple of the names on ancestry.com. First she looked up one of the most poetic names, Ella Laviolette, and found nothing. Next, she searched for two names that appeared to be husband and wife, John D. Pickles and Elizabeth Pickles, and found them on the 1880 census residing in Lawrence, MA. After several more successes, it became clear that the quilt was made in the late 1800s in the Boston area. Ann contacted Jane, who told her that the quilt had been purchased at a garage sale in Williamstown, MA. She then most graciously allowed Ann to keep the quilt so she could continue the research! After many, many more hours searching the ancestry files, Ann has found information about more than 150 of the people named on the quilt. The great majority were residents of Melrose. 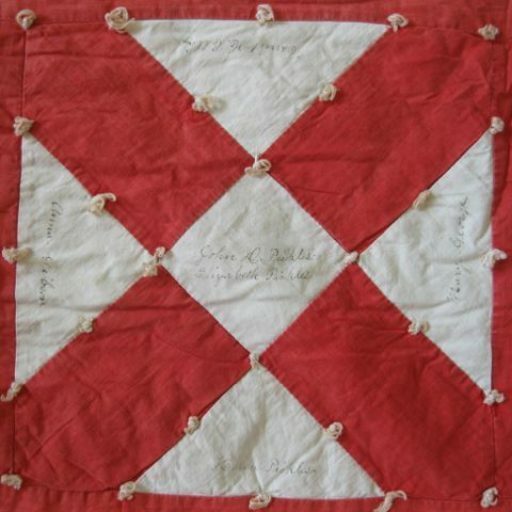 By tracking the birth, death, and marriage dates of the names on the quilt, she determined that the quilt had been made sometime after the birth of Kenneth Thompson on March 2, 1897, and before J.O. Littlefield’s death on May 1, 1898 and Clara Sievwright’s birth on May 3, 1898. While Ann was doing this research, along came the next magical step in the quilt’s life. Ann received an order for her book from Alanna Nelson, whose shipping address was right in Melrose, MA! She enclosed a note about the quilt with the book, and that became the seed for this exhibit and the quilt’s homecoming. Alanna put Ann in touch with the Melrose librarian Shelley O’Brien. Shelley checked through the town history materials in the library, shared them with Ann, and thereby helped locate even more of the people named on the quilt. So far, there is still no clear record of why the quilt was made. What we do know is that Melrose was busy planning a celebration of the town’s 1899 incorporation. We also know that there were renovations to the Methodist church, where John Pickles was minister, at that time as well. The quilt could have been a fundraising project for either of these events. There is so much other history hidden in the census records – family ties and family stories, the range of occupations, local history such as the manager and matron of the town poor farm. It has been a fascinating process for all of us. 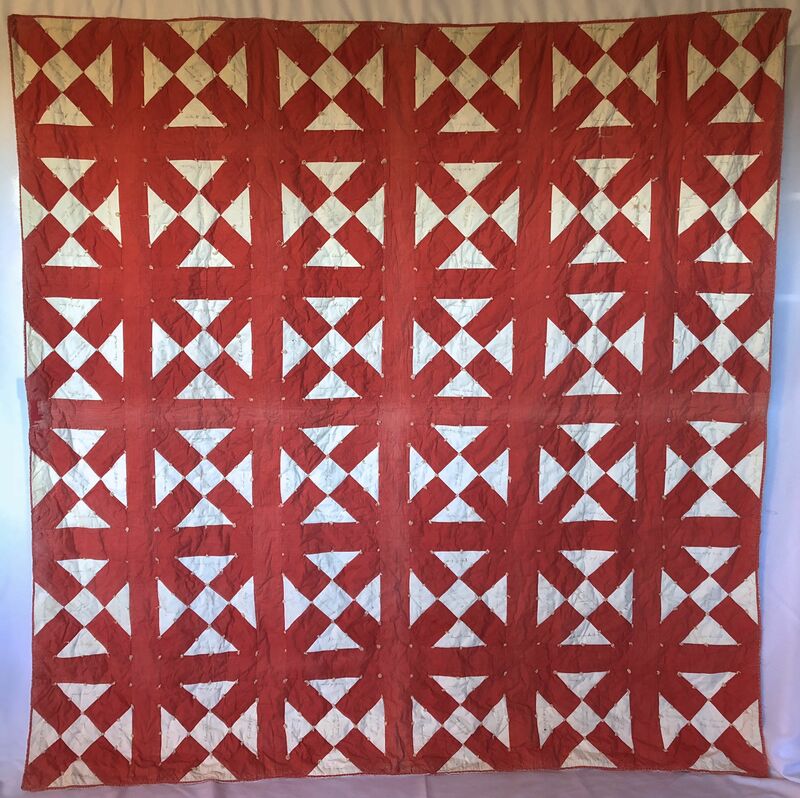 The quilt block used in the quilt was known as Snowflake in the 1800s, and is also now known as Old Italian Block. It has solid red and white fabrics on the front, and a red on white polka dot on the back. It is tied with white yarn. There was some damage to both the front and back which Ann repaired and a few old mends as well. Happily, all of the white pieces with the written names remain intact. Sadly though, the ink is fading, to the point that some of the names are quite difficult to read.